Interested in trying out DENSS? There is now a video tutorial describing the algorithm behind DENSS, how to download and install DENSS, and how to use DENSS. This video was done in collaboration with SBGRID’s YouTube channel. If you use SBGRID, DENSS will be installed and available for you as part of their supported packages. DENSS now has a new mode for membrane proteins. Membrane proteins are often solubilized in detergents or lipid nanodiscs. The hydrophobic regions of these molecules often have lesser scattering density than the bulk solvent, resulting in a negative contrast relative to the solvent. The default setting for DENSS enforces a positivity restraint that will not allow any density to be negative. While this is appropriate for most standard biomolecules such as proteins and nucleic acids, is it not appropriate for molecules containing regions of negative contrast. To accommodate this scenario, there is a new MEMBRANE mode in addition to the previously available FAST and SLOW modes. This mode disables the positivity restraint and starts shrink-wrap immediately. As the negative of an image has the same Fourier transform as the images, the sign is ambiguous. To help ensure the positive and negative regions are most consistent when averaging, denss() now checks if there is greater negative density than positive density before saving the final map. If so, the map is multiplied by -1. This does not ensure the sign of the density is correct, just that the sign of the density is most likely to be the same for multiple reconstructions for averaging. See the Basic Usage tutorial page for more details on how to use this new mode. DENSS now includes the ability to impose symmetry to improve the resolution of reconstructions. DENSS first aligns the principal axes of the map with the x, y, and z axes. Then the value of the map at each symmetry mate location is set to the average of all related values. Imposing symmetry is as easy as setting the -ncs option. Click here to learn more. DENSS now has a new built-in averaging procedure since v1.4.4. The alignment works by first performing a coarse-grained rotational search uniformly sampled around a sphere to find the best coarse alignment. Then a fine alignment is performed using minimization including rotational and translational degrees of freedom. Enantiomer generation and selection is included, as well as the use of a binary tree algorithm for creating a reference volume for alignment. Previously averaging was dependent on the installation of EMAN2, a powerful suite of tools primarily designed for reconstructing electron microscopy volumes. However, EMAN2 is a large package and DENSS only uses a small part of that package. Our new built-in procedure was made partially to alleviate this dependency. This update contains a host of new scripts for performing various tasks. The primary script for performing multiple runs of DENSS and averaging the results is denss.all.py. Additional scripts enable alignment of maps to models, calculation of resolution, and even a new refinement script. For a full list of the new scripts and tutorials on how to use them, click here. The new averaging procedure has been tested and works on Windows as well. The popular RAW SAS data processing package contains the new averaging procedure as well as of RAW v5.0. Thanks to Nhan Nguyen for his help writing much of the code. Three new scripts have been uploaded to the DENSS github repository. 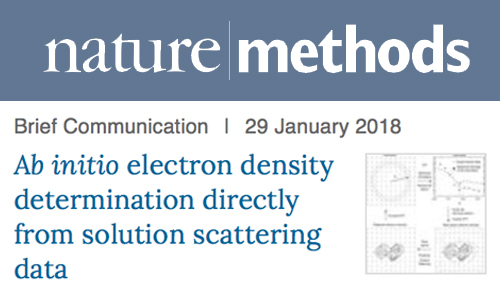 These scripts include: the ability to fit smooth functions to noisy experimental data (required for denss.py input), calculate scattering profiles from electron density maps, and calculate electron density maps from PDB files. DENSS has now been directly implemented within the popular RAW software package for SAXS data reduction and analysis (RAW v1.4.0). RAW contains many useful features for analyzing solution scattering data, including creation of 1D scattering profiles from 2D detector images, standard data operations such as averaging and subtraction, analysis of radius of gyration (Rg) and molecular weight, and advanced analysis using GNOM and DAMMIF. It also allows easy processing of inline SEC-SAXS data and data deconvolution using the evolving factor analysis (EFA) method. One of the main advantages to installing RAW for using DENSS, is that it DENSS is natively implemented in RAW, meaning you do not have to have a separate installation of DENSS to run it. RAW also provides a convenient graphical interface for running DENSS. For averaging, install EMAN2 and RAW will automatically find your EMAN2 installation and run the averaging procedure for you. Many thanks to Jesse Hopkins and the RAW team for providing this for the community! Click here to download RAW. Click here to see a tutorial for how to run DENSS in RAW. The online server DENSSWeb is now available for researchers to upload their data and perform calculations with DENSS, including full averaging with EMAN2. 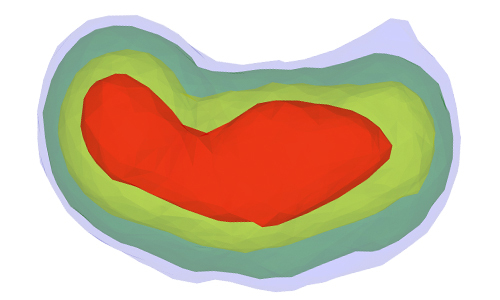 DENSSWeb includes an interactive viewer for visualizing the averaged electron density map in 3D using LiteMol. DENSSWeb is also a web-based front end graphical interface that can be downloaded for personal use to perform more advanced calculations in a convenient manner, including the interactive viewer. The algorithm behind DENSS was published online in the high-impact journal Nature Methods. With a 5-year impact factor of 35, Nature Methods remains one of the most high-impact academic journals in the world! DENSS.org is a website dedicated to the development and usage of DENSS, an algorithm for calculating electron density from solution scattering data. DENSS.org will contain the latest updates and developments and provide a central resource for the community for using the software. Instructions for installation and usage, tips, and best practices can all be found here. If you have any questions, send a message to the author below.